The Libraries invites all faculty members and graduate students to participate in the Reskilling and Upskilling Researchers Workshop on 7 November 2015, Saturday, 9:00AM-11:30AM to be held at ​​Phinma E-Classroom, Room 303, Miguel Building. Said workshop will be facilitated by Ms. Willian SA Frias, Readers' Services Librarian and Mr. Pio Salvador Ramon Omana of Elsevier Science and Technology. ​​​The workshop aims to​ ​help faculty and graduate students gather, organize, analyze, visualize and manage scholarly outputs and references using ​​research tools. ​It is specifically designed to provide instruction on the use of reference management tools in their studies and research work. Interested faculty members and graduate students are requested to kind​​y fill out this Online Registration Form to register. Forty (40) slots are available for this workshop. ​Registration ends at 5:00PM on Thursday, 0​5 November 2015. ​As part of the IamInfoSMART 2015 campaign of making every Lasallian information literate, the Libraries will hold a special session of the Face-to-Face with RIA (Roving Information Assistant) service called RIA’s Research Help Desk on 04 November 2015 (Wednesday), 9:00am - 4:00pm at the 6th floor Exhibit Area of The Learning Commons, Henry Sy Sr. Hall. 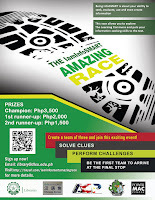 The IamInfoSMART Amazing Race is back for year 3! 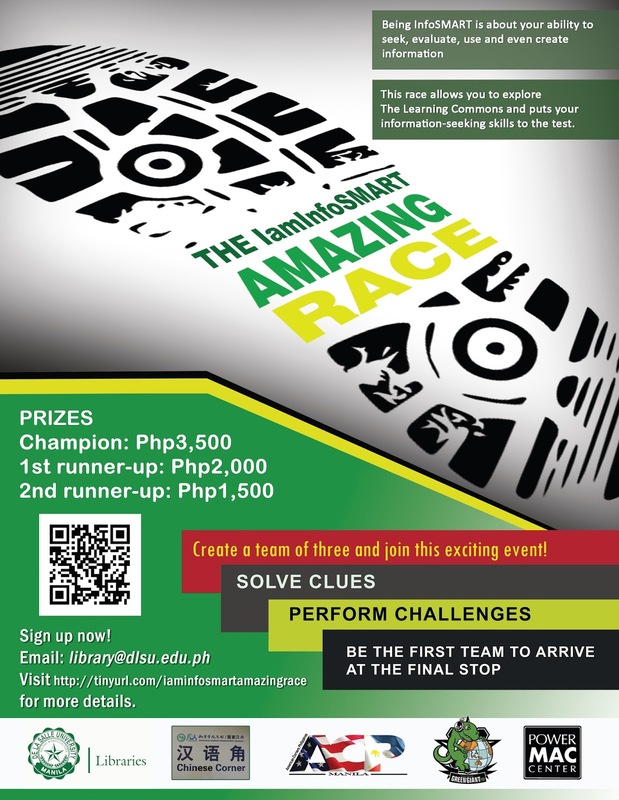 As part of the IamInfoSMART campaign of making every Lasallian information literate, the Libraries will hold the IamInfoSMART Amazing Race on 06 November 2015 (Friday), 1:00pm with the start line at the 6th floor Exhibit Area of The Learning Commons, Henry Sy, Sr. Hall. Now on its​ ​third ​year, the Libraries will be running its Information Literacy (IL) campaign called IamInfoSMART with the theme, "​Done Searching, Now Sharing: Advancing Information Literacy Skills for the Responsible and Ethical Use of Information”, on 03​-07 November 201​5 at The Learning Commons. This activity is in line with the celebration of the Libraryand Information Services (LIS) month this November. IamInfoSMART 201​5 is a week-long fair of exhibitions, learning sessions and interactive games, which aims at honing the IL skills of students and raising awareness on the importance of IL in their pursuit for academic and research excellence. Updates on IamInfoSMART 2015​ and other upcoming activities will be announced through the Libraries' Facebook page. In observance of the National Mental Health Week (Proclamation No. 452, s. 1994), the Libraries proudly presents, Girl, ​I​nterrupted as Video Pick of the Week. ​The film was directed by James Mangold, starring Winona Ryder and Angelina Jolie. It will run from October 12-17, 2015 at the TV corner, The Learning Commons, 6th floor, Henry Sy Sr. Hall. “In 1967, after a session with a psychiatrist she had never seen before, 18-year old Susanna Kaysen was sent to McLean Hospital. She spent most of the next two years on the ward for teenage girls. Kaysen's memoir encompasses horror and razor-edged perception while providing vivid portraits of her fellow patients and their keepers”​(from source video). On its continued efforts to reduce discrimination and breaking stereotypes, the third session of the human library was successfully held last September 29, 2015 at the European Documentation Centre, The Learning Commons, 13/f Henry Sy Sr. Hall. The session’s theme is entitled “Negotiating Identities: The Filipino-Chinese Amongst Us.” This activity is in partnership with the Chinese Corner and the De La Salle Alumni Association - CLA Chapter. An inspirational message in Chinese language was delivered by Mr. Rodrigo Wong, Jr., DLSAA CLA Board Member, which was translated in English language by Mr. Dane So from ENGLICOM. In his message, Mr. Wong told that stories came from our memories and that memory is a good source of an oral history. He added that “the human library project wants to relive memories, to narrate experience [and] to tell untold stories.” In her opening remarks, Dr. Maria Caridad H. Tarroja, Director of the Social Development Research Center commended the Libraries for this important endeavor as a source of an alternative learning experience. Nine human books arrived and were briefly introduced. Below are their human book titles with their corresponding descriptions. Six library personnel were recognized during the 4th DLSU Annual Institutional Service Awards on 18 September 2015 at the Teresa G. Yuchengco Auditorium, as they completed at least a decade of service to the University. The awardees were Catherine Cabonegro and Augusto Gallo, Jr., 15-year awardees; Willian Frias, 20-year awardee; and, Renato Abellera, Florbella Bongalos and Amelia Maula, 35-year awardees. Catherine Cabonegro is currently assigned at the European Documentation Centre at the Learning Commons. She first set her feet in the University in 1999 as a contractual staff. In 2000, she was given a permanent position as a clerk in the Technical Services section. Cathy, as her fellow Lasallians call her, believes working in DLSU developed her personality from being a shy little kitten to a person who is now confident in dealing with people and determined in getting good things done. She specifically thanks God for directing her to DLSU when she was looking for a second home to develop and nourish her self-esteem. Augusto Gallo, who is better known as Jhun, on the other hand, started as a library clerk at the European Documentation Centre in 2000, and is now working at the Technical Services. He is known in the University for his athleticism and his never-beaten record as champion in chess. Willian "Ian" Frias, the lone Academic Service Faculty (ASF) in the group, started her career in the University as an assistant librarian at the Periodicals section in 1992. Barely two years in the institution, Ian was granted fellowship by DLSU and DOST to complete her master’s degree in Library Science. Twenty years later, she considers herself a journeyman in the library, having been assigned to different units, performing various tasks, and occupying different positions, namely: Periodicals Librarian, Collection Development Librarian, Technical Services Head, Public Programs Librarian, Assistant Director for Support Services, and finally, Law Librarian. Having been married to a fellow Lasallian, she considers her family as an extension of St. La Salle’s family. According to her, her children will grow up reflecting the charisms of the school’s founder, St. John Baptiste De La Salle. 35-year-awardee Florbella “Gabi” Bongalos looks up to DLSU as a home for people like her, who is very thankful and proud to be a Lasallian. She was able to reach this far because in DLSU, “[My] learning experience has never stopped, and each day I see a new dimension to the DLSU vision and mission as lived through a very simple life. I love what I do”. Gabi's valuable contribution to the University includes effective chronicling of significant events, development, and Lasallian personalities in the DLSU Diary, a database of events and milestones of the University since 1911. She is a topnotcher in the 2006 Licensure Examination for Librarians and a certified Filipino archivist by the Academy of Certified Archivists. She sees the University as a vibrant community of tradition following its mission, which for her is a great place like home. In her 35 years in the University, Amelia Maula was able to have a “tour” of office from the President’s Office to CLA Dean’s Office, then to a Department Chair’s Office, until she found her permanent office in the Libraries. Being a journey person enabled Amy, as she is fondly called by her friends and colleagues, she had an opportunity to work with the Br. Andrew Gonzalez, FSC, as his assistant in charge of the welfare of visiting professors, distinguished guests and special visitors of the University. She had also worked with a University Fellows, Dr. Tish Bautista, as the dean’s secretary. Amy is currently assigned at the University Archives where she finds a work–life balance environment. Looking forward to her retirement, she is definitely happy with the warm treatment she earned from her co-workers. Finally, Renato "Ato" Abellera of the Instructional Media Services spends his 35 years in the Libraries. He has been an AV technician long before the establishment of IMS. Ato never fail to attend training that would continuously upskill and re-skill him in audiovisual services. At present, Atoz is the favorite videographer in the campus.